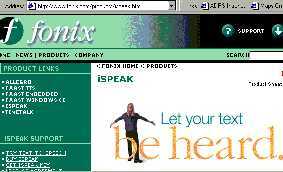 This text to speech software integrates with Outlook 2000 to convert email into spoken language. The software can convert text into WAV or MP3 files, which can be stored on a portable MP3 player and listened to at a later date. The software reads with intonations, and is supposed to recognize punctuation marks, pausing appropriately for commas and periods, and uses an interrogative tone for questions. It will also read numbers like 36,000,000 as thirty six million instead of 3 6 0 0 0 0 0 0 . The software currently costs $69.95, and a demo is available from the Fonix web site. For more information, go to http://www.techtv.com/products/software/story/0,23008,3337192,00.html for a review. http://www.fonix.com/products/ispeak.html to visit the company web site. The Jordy, made by Enhanced Vision Systems of Huntington Beach, California, helps people with vision loss from conditions such as macular degeneration, glaucoma, and optic neuropathy. The system is designed for people with a central vision loss. The Jordy is a computer controlled magnifying system that is worn like a set of glasses. A images from a camera mounted on the glasses are processed and projected on a pair of LCD (liquid crystal display) screens in front of the users eyes. The image may be enlarged from up to 40x, and the system can manipulate colors and change contrasts. An individual with 20/400 vision may be improved to 20/40. http://www.enhancedvision.com/jordy.htm to visit the company web site.